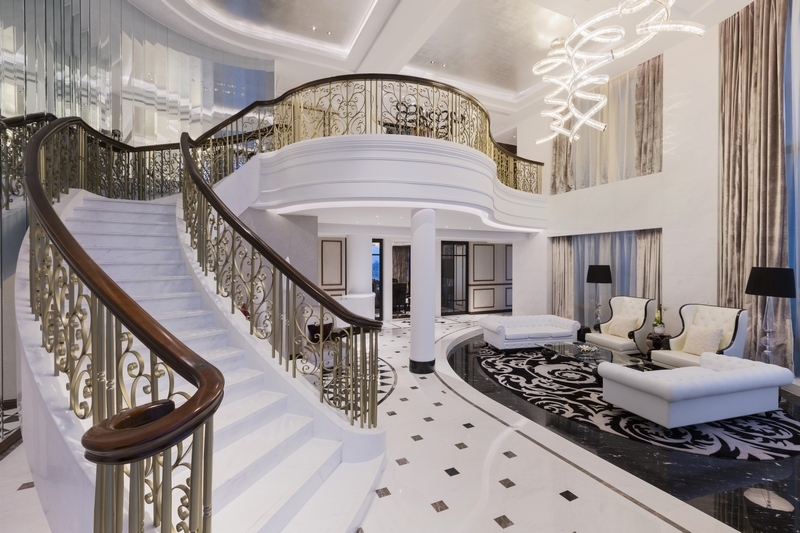 In its recently completed ‘Master Residences’ Yinchuan, URBANPROJECTS has blended elements of Islamic architecture with innovative residential planning to create a development that is sympathetic to both people and place. The development represents the second phase of a larger mixed-use masterplan also by URBANPROJECTS. Approximately 1,200km to the west of Beijing, lies the city of Yinchuan, capital of the Ningxia Hui Autonomous Region in central northern China. Enveloped by the vast sandy plains of the greater Gobi Desert, Yinchuan has a population of approximately 2 million, demographically, the city is predominantly Muslim. Yinchuan is an ancient frontier city, one of the earliest places in China to be colonised during the invasion of Genghis Khan, fragments of the Great Wall can still be seen within the city. The Yellow river flows just to the north and the edge of the Himalayan plateau is visible to the west across a great grassy plain. The city is subject to harsh extremes of weather year-round. In summer, temperatures average above +30 with savage sand storms appearing out of the desert on a regular basis. Winter brings temperatures as low as -15 with regular snowfall. This is an extreme environment and a culturally complex society that demands a sensitive architectural approach. In 2005, URBANPROJECTS was invited to masterplan a strategic quadrant at the periphery of Yinchuan’s ambitious new civic & cultural CBD. The new CBD incorporates a provincial government administrative centre, new art gallery, museum, library and convention / conferencing facilities. Around the ‘core’ of this CBD, satellite parcels dedicated to support facilities: hotel, office, retail & residential have been identified – the Master Residences masterplan is located on one of these parcels. URBANPROJECTS’ challenge was to develop the masterplan (and execute its subsequent phases) within the context of a proud and independent culture tracing its roots back to the ancient silk road. “Rather than referencing directly from the traditional Islamic ‘pattern book’, it was an interpretative process. As a practice we try to take the local culture and respect what that culture is about. We bring new ideas and expertise but we always try to find the ‘essence’ of any context”. It was clear from the beginning that the client and local authority wished to make particular reference to the Islamic heritage of the region and the two millennia of history centred on the city. Hong Kong based design studio began working with the client in 2005. URBANPROJECTS masterplan, first conceived in 2006, incorporated four phases of development. 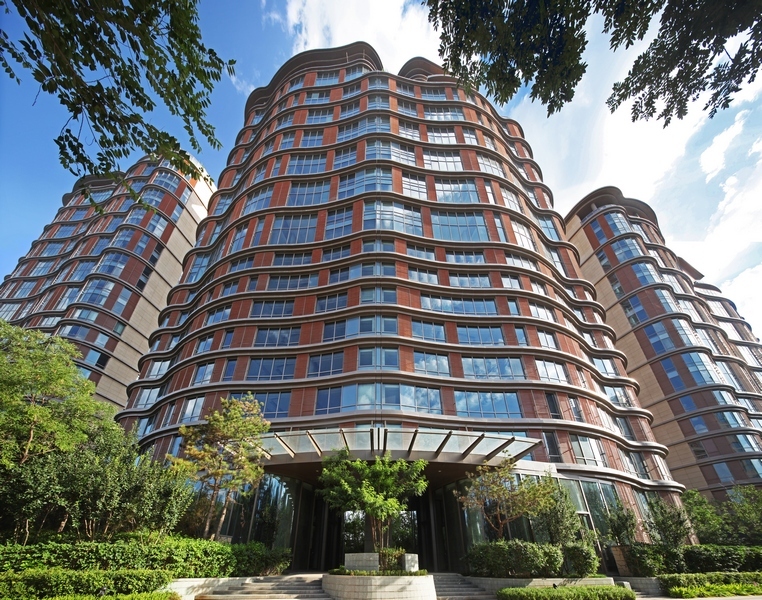 The first phase, comprising an elliptical stainless-steel clad office tower, retail podium and a 400 key Kempinski Hotel (Yinchuan’s first five-star brand) was completed in 2010 and has since enjoyed both critical and commercial success. Phase 2, ‘The Master Residences’ was immediately initiated, comprising three stepped residential towers arrayed along the south edge of a central landscape park. Beneath this park, a subterranean resident’s club and parking structure lies hidden, providing a natural green pedestrian environment at grade. Future phases, currently under design include a further four residential towers and a landmark 300m point tower incorporating retail & commercial office space below a five star-hotel. Ullah describes the ‘Master Residences’ as a “landscaped oasis”, a secret garden enclosed by organic residential towers, where vehicular access is deliberately curtailed and space is given over to people as much as possible. 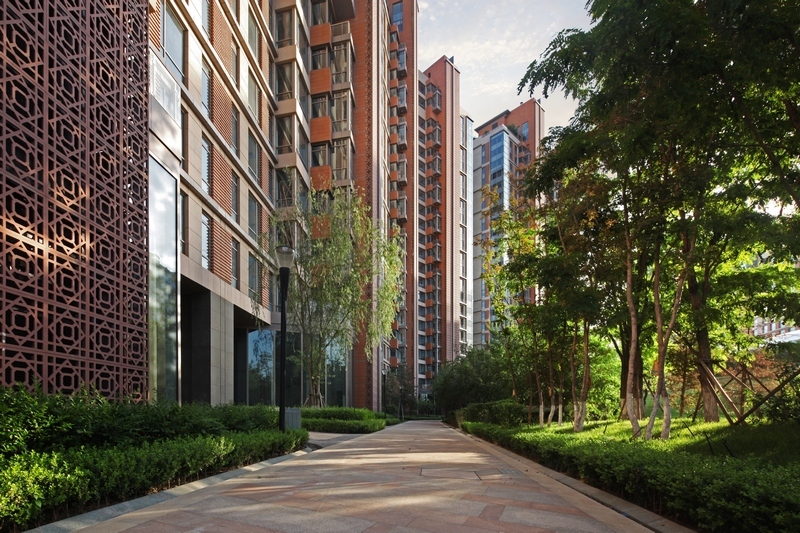 The central landscape space is sheltered from the harsh environment, a micro-climate is created within, protecting the garden from the winds & sandstorms prevalent in Yinchuan. The three residential towers vary in height from 14 floors to 30 floors and mix substantial duplex units with standard simplex apartments and six ‘trophy’ penthouses on the upper levels. All units enjoy full southern exposure (critical at this northern latitude) and a northern aspect oriented to maximise views towards the central government enclave and the mountains beyond. To avoid the repetitive morphology of high-rise residential developments, no two units are the same on a typical level, creating individual identities for each apartment. Apartment layouts are responsive to the views and placed with sensitivity in relation to neighbouring units. Ullah and his team also had to respect religious and cultural traditions in planning, placement of fenestration and provision of privacy & security throughout the development. Part of the solution to these cultural challenges came from the new application of an ancient materials & technologies. The ‘form’ & ‘fabric’ of the Master Residences towers are directly responsive to the cultural, climatic and contextual environment in which they are located. The ‘forms’ are responsive to orientation: Rational and functional volumes defined by vertical circulation, MEP spaces and service areas define the north facades. In contrast the south, east and west facades dissolve into an organic ribbon undulating along the perimeter of the site. The ‘fabric’ of the towers is equally responsive to aspect and orientation: a simple palette of materials, yellow flamed granite, terracotta & glass define the façade. These are durable materials ‘of the earth’ and reflective of the dry desert environment of Yinchuan. 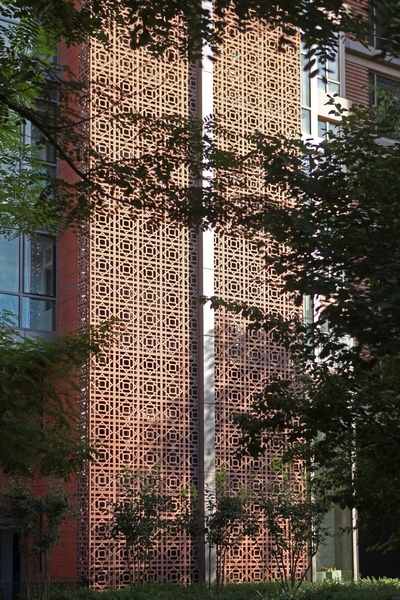 An oblique reference to Islamic iconography is woven into the façade – terracotta panelling in a repetitive geometric pattern echoes the ‘Jali Screen’, ubiquitous throughout the Islamic world. The façade is given a sense of ‘movement’ by the incorporation of terracotta screens, apparently randomly arrayed across the undulating facades. There is a sense of mystery about these textures, again so evocative of the Islamic world, what lies within? The intricate patterns evolve, based on principles of exponential repetition and, in this case, they cloak the structures in an Islamic “curtain” without parodying historic styles or creating pastiche. 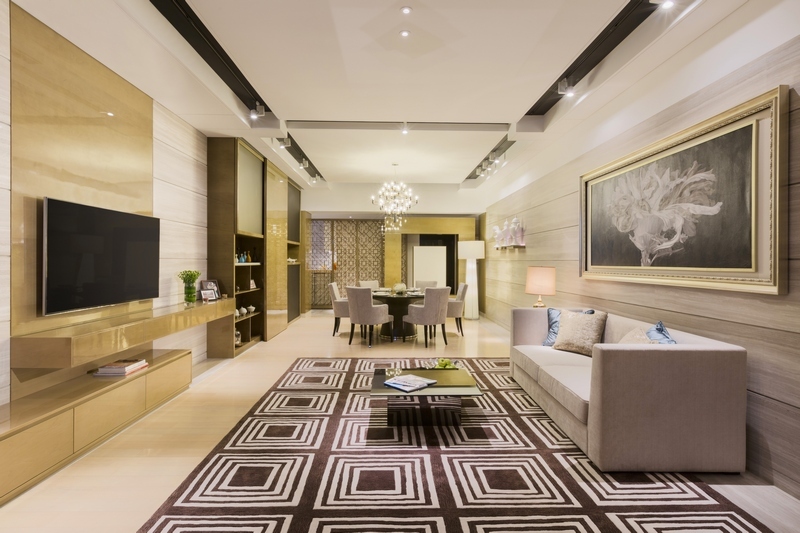 “The high-level specification for The Master Residences has also helped to create a building of far superior quality to most current developments in major cities such as Beijing or Shanghai,” says Ullah. That quality is exemplified by the use of high end European & North American subcontractors for elements such as the terracotta facade screens (by Sannini of Florence, Italy) and the window & curtain wall systems (by Schuco of Germany). European kitchens, sanitary ware and furniture are also specified throughout. 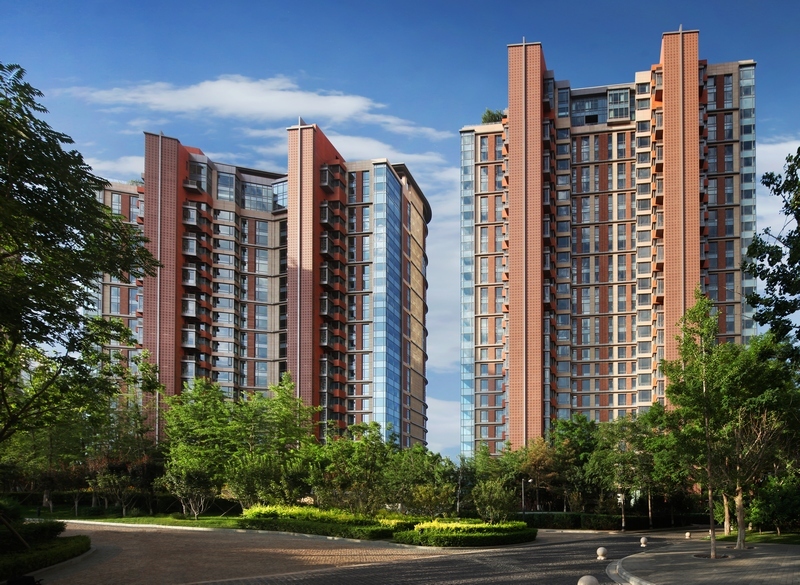 The Master Residences, Yinchuan represents the pinnacle of residential design. It is well planned, beautifully detailed and timeless in its simplicity and rejection of ‘style’ over substance. This can also be seen as URBANPROJECTS’ philosophy and an expression of its own culture.